The shape of the leaves make Aloe plicatilis unique, no other aloes are related to it. Aloe plicatilis is similiar to Aloe heamanthifolia but it is small and stemless. The name "plicatilis" means "fan-like" or "pleated". Common Names: Fan aloe, Bergaalwyn (Mountain Aloe), Franshoekaalwyn (Franshoek Aloe), Tongaalwyn (Tongue Aloe). Distribution: South-Western Cape, Aloe plicatilis can be found growing on rocky-slopes in moutains of the sw Cape. From Franshoek to Elandskloof (well known on the Du Toits Kloof Pass). Occurs in a winter rainfall region (600mm - 1200mm per annum). South African national tree number is 29.6. 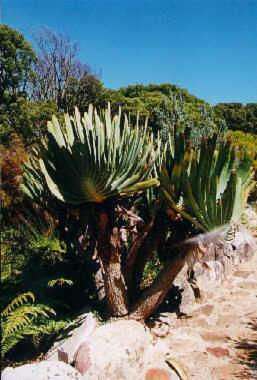 Aloe plicatilis grows up to 5 m tall with dichotomous branches and grey stems which end in fans of distichous leaves. The clusters of leaves resemble a fan hence the name. The gey-green leaves are rounded at the apices which are often tinted pink, leaves are 400mm in length and 40mm in width. The leaf-margin is cartilaginous with fine teeth. The leaf sap is clear but crystalize to form a pale yellow solid. Simple inflorescence (500 mm) with a cylindric raceme of scarlet flowers. There is up to thirty tubular lowers that are scarlet in colour and 50mm in length. Aloe plicatilis flowers from August to October. Flowering Time: Flowers in Spring, throughout August to October. Watering: Careful watering during summer. Notes: Aloe plicatilis is relatively easy to grow in cultivation but careful attention must be given to summer waterings.